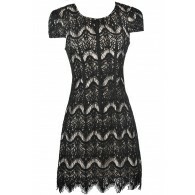 You have added Separate Matters Mesh Waistband Dress in Black into shopping cart. The mesh waistband adds a little edgy look to a classic A-line cut. The Separate Matters Mesh Waistband Dress is fully lined except at the mesh waistband. 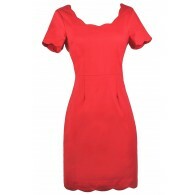 This dress is a stretchy heavy knit fabric and has capsleeves. A hidden back zipper completes this dress. This dress will be your new favorite little black dress! You can dress it up with pumps and statement jewelry or dress it down with flats. Details: Fully lined except at waist. Hidden back zipper. 64% rayon, 31% nylon, 5% spandex. Lining: 100% polyester. Hand wash cold. Do not bleach. Hang or Line Dry. Small measurements: Length from top of shoulder to hemline: 32”. Bust: 34”. You have added Separate Matters Mesh Waistband Dress in Black into Wishlist. You have added Separate Matters Mesh Waistband Dress in Black for Stock Notification. You have set Separate Matters Mesh Waistband Dress in Black as a loved product. You have removed Separate Matters Mesh Waistband Dress in Black as a loved product.